Aliens / Vampirella #1, is a brand new six part series from Dynamite, by writer Corinna Bechko, featuring art by Javier Garcia-Miranda, and colors by In LIGHT Studios, certainly has a very interesting premise. There is a lot of potential here; the tantalizing idea of having a character like Vampirella squaring off against the acid-blooded Xenomorphs on Mars is certainly appealing. Corinna Bechko gets things off to a good start with a fittingly blood-drenched, acid-splattering, flashback that quickly established past events. From here, the pace slows somewhat as we flash-forward to Vamperilla’s arrival on Mars, where she meets the crew of Mars Base One, and learns that the base they’ve found beneath the surface could well be tens of thousands of years old. The familiar themes of the Aliens franchise are all present and correct, there’s a group of humans on a distant world, lots of dark spooky corridors to wander down, and even a chamber full of rather gooey looking eggs. Yes, you know the drill. While it ticks all the boxes, this issue first doesn’t really do anything new with these tried-and-trusted themes. Sure, it sets the scene well enough, but even the crew seem indistinguishable from what we’ve seen many times before, and Vampirella gets no real chance to put her abilities to much use either. Fortunately, after a rather mundane mid-section, this first issue gradually builds to a blood-splattered climax. Corinna Bechko uses some ingenious plot twists here, particularly an unsettling face hugger experience / vision that provides us with further clues about what happened, and the closing moments are both shockingly visceral and violent. 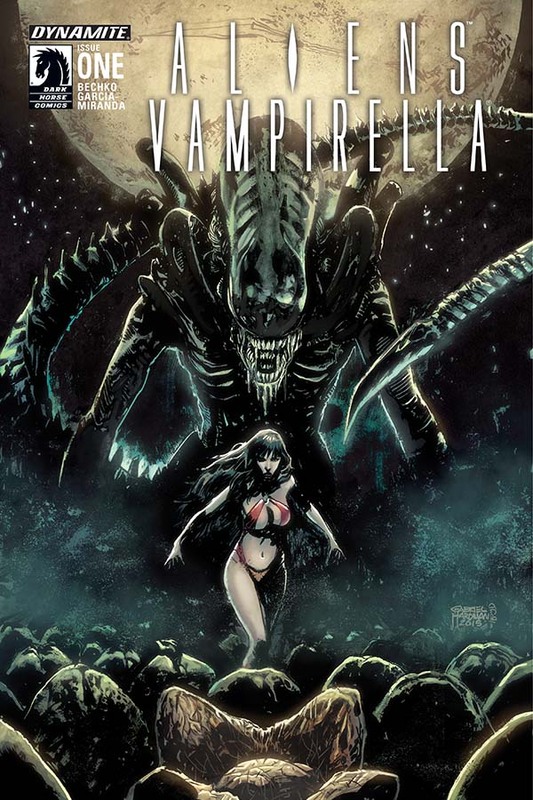 Vampirella fighting the Xenomorphs is an uncanny mash-up of themes and ideas. The Aliens franchise has always had strong female lead characters, so Vampirella is a perfect choice to battle the Xenomorphs. Although Aliens / Vampirella #1 gets a bit bogged down with too much exposition initially, it does begin to measure up to the potential of its premise towards the end of the issue. 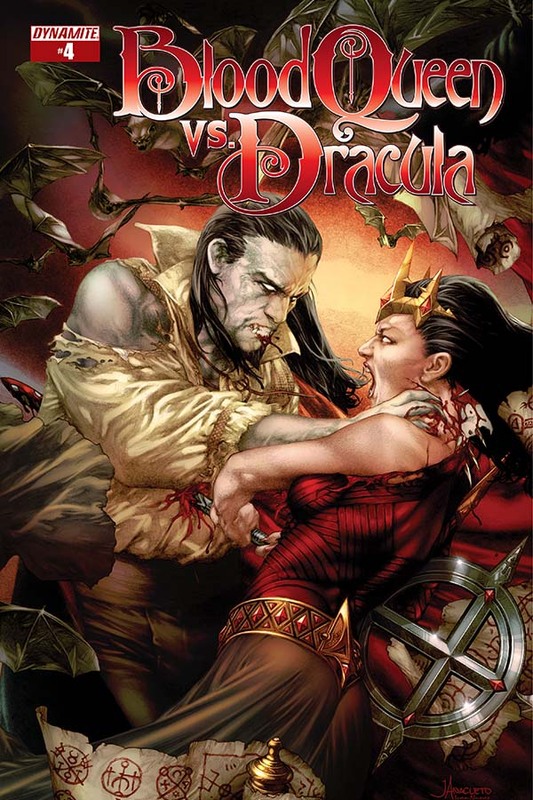 Corinna Bechko and Javier Garcia-Miranda have done a great job with issue #1, but future issues of this Dynamite mini-series will need to be a bit less formulaic where the Aliens are concerned and make a lot more use of Vampirella if it is to really impress.